Department of Defense (DoD) spending for work primarily performed in the Capital Region rose over the year by 12.2 percent in fiscal 2017. In fiscal 2017, the amount the federal government owed1 for unclassified contract and grant award transactions was $151.1 million for work primarily performed in the eight-county region2, according to a Center for Economic Growth analysis of data from USASpending.gov. 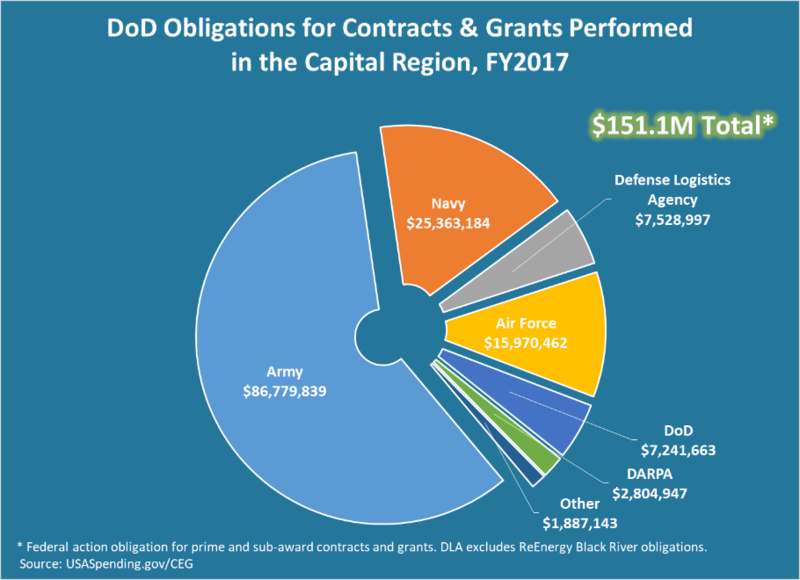 At $86.7 million in contract and grants, the Department of the Army accounted for the greatest share of DoD obligations for work formed in the region, followed by the Department of the Navy at $25.4 million and Department of the Air Force at $16 million. In fiscal 2017, DoD was obligated to 400 firms with unique Data Universal Numbering System (DUNS) codes for contracts with work performed in the Capital Region. Federal action obligations exceeded $1 million for about 20 of those defense contractors. 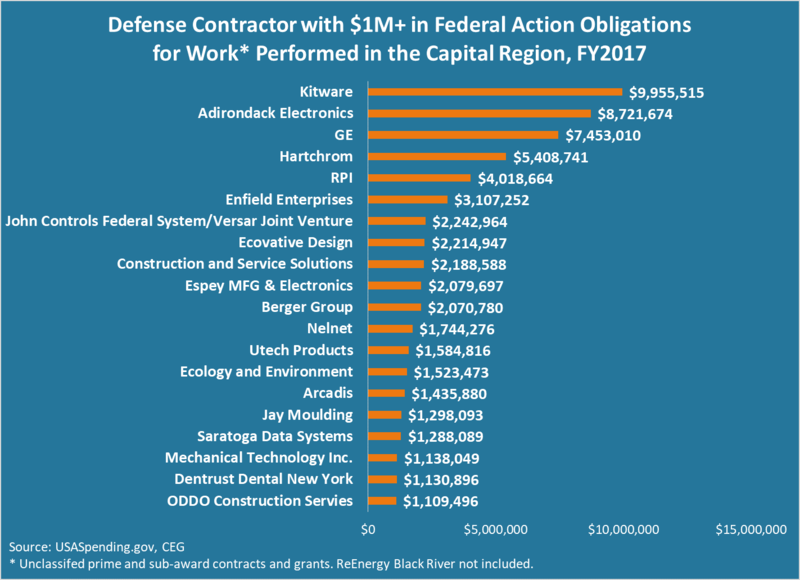 Major defense contractors with federal obligations exceeding $1 million on contracts for work performed in the Capital Region in fiscal 2017 were Kitware in Clifton Park ($9.96 million), Adirondack Electronics in Round Lake ($8.7 million), GE ($7.5 million) and STI Hartchrom in Watervliet ($5.4 million). Among these major defense contractors, those that saw sizable year-over-year increases in federal action obligations on contracts with work performed in the region included Ecovative Design (427.6 percent to $2.2 million), Espey MFG & Electronics (91.4 percent to $2.1 million), Kitware (36.3 percent to $9.96 million) and GE (24.4 percent to $7.5 million). In fiscal 2017 there were seven firms, agencies and institutions that received DoD grants for work performed in the region. Leading them was the New York Division of Military and Naval Affairs at $45 million, followed by Rensselaer Polytechnic Institute at $7 million. RPI also received $4 million for contracts with work performed in the region. Other major grant awardees included GE at $3.8 million, the SUNY Research Foundation at $1.7 million and Albany Medical College at $497,700. CEG has extensive experience assisting Capital Region manufacturing and technology firms obtain DoD contracts, through its position as a regional technology center under the New York Manufacturing Extension Partnership program, which is facilitated by the National Institute of Standards and Technology and New York Empire State Development Division of Science, Technology and Innovation. 1Federal action obligation: The amount that the federal government has obligated for the award. The Current Total Value also includes any non-federal funding for the award. 2Total excludes $10.7 million obligated to ReEnergy Black River. Although USASpending.gov lists this contractors contracts as being primarily performed in Latham, they are related to the electricity generated by a biomass facility for Fort Drum.